The Indigenous Celebration started with an opening ceremony led by the elders of the Dayak Maanyan community of Central Kalimantan. A prayer ritual was led asking for protection and permission from their ancestors to guard the sacred ground of the Arma, Ubud, Bali, which involved a sprinkling of rice and holy water. In the tradition of respect for nature and honouring the visible and invisible world, the 3-day Indigenous celebration was indeed blessed with beauty, artistic performance, friendship, collaboration, unity and strong intercultural relationships. The Indigenous Celebration staged at the Arma Museum in Ubud, Bali on May 11-13 brought together a sense of connection between the Indigenous people of Indonesia and seven invited countries from the Pacific and the tribal lands of Odisha and Nagaland, India. This tribal gathering was an inaugural event and 200 Indigenous people came from the rivers, jungles and small villages to meet together in Bali for the first time to share their knowledge, wisdom, and deliver artists performances that resonated with ancient rhythms, songlines and sacred dances. The Indigenous identity of these nations including 34 tribes from Indonesia aimed to reinforce the purity of Indigenous identity. The celebration achieved this. Along with spectacular evening dance performances against a beautiful stage set infused with mapping and tribal themed lighting, intimate storytelling was also delivered by tribal elders and solo poetry reading. Daytime workshops, which included weaving demonstrations by West Timor, tattooing by the Mentawai and Dayak Iban and sound healing by the New Zealand Maori, were just some of the 29 workshops offered. These attractions brought in a crowd of 2,500 people to the event. The celebration of Indigenous peoples was initiated by David Metcalf, the owner of Taksu Photo Gallery in Ubud, Bali, a photographer and author who focuses on indigenous documentation in Indonesia and the founder of Yayasan Ranu Welum, Central Kalimantan, Emmanuela Shinta. With the support of the New Zealand Embassy and partners including rma Museum, Green School, event organisers Antida Music Production, and other partners this event brought elements of performance art, education and culture together. Janice commented, “This weekend I was treated to a unique experience at The Indigenous Celebration. The 3-day indigenous cultural awareness festival brought together people from all over the Pacific, Indonesia and the world to share their stories, dance, music and culture. I learned so much! From finding out about schools that embrace a traditional education learning and sharing environment started in Borneo to preserve an ancient way of life, to hearing how honey is harvested and bees are sung to, to seeing how world class photographers and artists have worked with and honored native cultures to dancing with a Dayak chief, this was a weekend I will never forget! Kudos to the organizers and the people who traveled to Bali to share their wisdom and special gifts, this is what the world needs now to unite the different peoples of the Earth and celebrate our diversity and heritage. The Indigenous Celebration has pledged to plant one tree in Kalimantan from each ticket sold, and Emmanuela said, “This celebration event was a showcase for our Indigenous identity, strength, and diversity.” Together with David Metcalf, they handpicked the 34 Indigenous groups which included Gayo Aceh, Antoni from West Timor, Dayak Punan, an Australian Aboriginal group, Dayak Kenyah, Marind from Papua and a New Zealand Maori group. Most of the tribes came straight from the jungles, rivers and small villages. 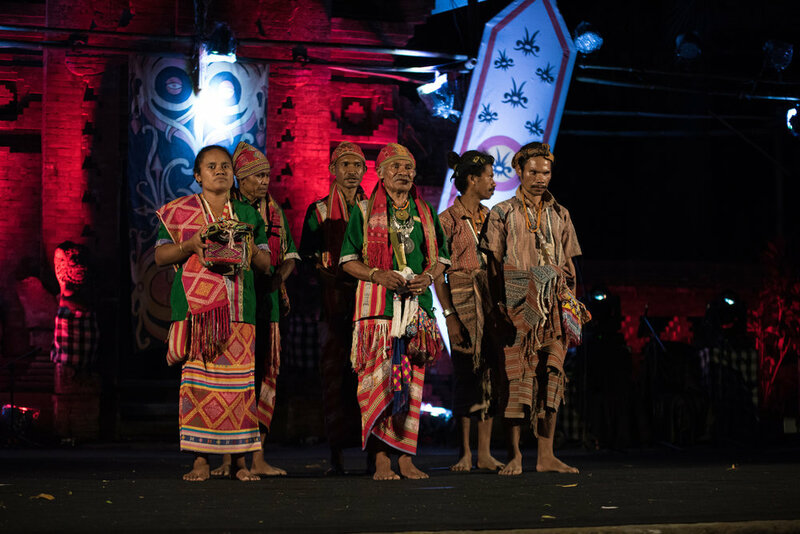 The evening programme included not only dancing and singing (some groups had 30 performers on stage), but also storytelling from the elders themselves, plus poetry and even a tattooing demonstration live on stage with the Mentawai masters and the Dayak Iban. A 2-day educational programme at the Green School followed on May 15 and 16 which included the elders from the tribes meeting the young students in the classrooms and finished with a panel discussion between seven tribal groups including Odisha, India and the Atoni tribe of West Timor. The Indigenous Celebration is planned to be an annual event. Next year it is hoped more Embassies and corporate sponsors who have a genuine cultural ethos will come on board as partners in a spirit of cross-cultural collaboration to recall the solidarity of nature, tribal traditions, preservation and honour of the diversity of the archipelago that reinforces the identity of Indonesia and the world. science and language. Psst: it may even help raise test scores, says Sir Ken Robinson. Bali was chosen as host for the event because its unique attributes that has made the Island the heart of culture for Indonesia. The event will attract indigenous groups from Indonesia and abroad including Australian aboriginals, Maori's from New Zealand, and Nagaland tribes’ people from Northeast India. In all, 32 different indigenous groups will represent 7 countries featuring indigenous dancers, musicians, storytellers, elders and youth leaders will gather at The Arma Museum & Resort.